This is a round Globe Ethyl porcelain sign. 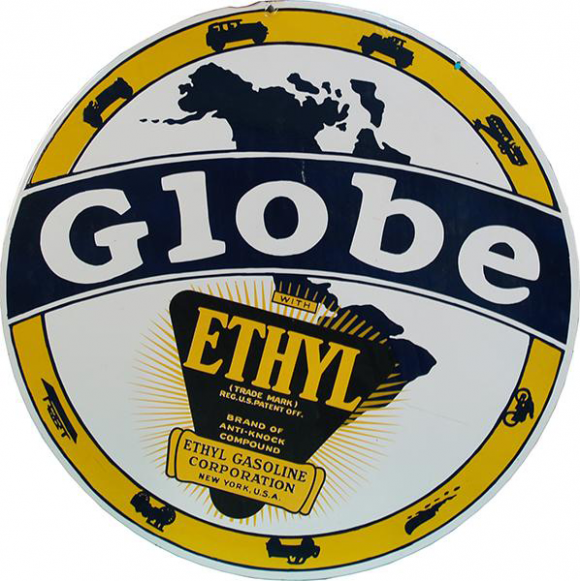 This particular Globe Ethyl sign is blue, yellow, and white. It reads, “Globe with Ethyl, Trade Mark, Reg. U.S. Patent Off., Brand of Anti-Knock Compound, Ethyl Gasoline Corporation, New York, USA” and features a map view of North and South America with a yellow border containing different types of transportation vehicles.